I didn’t even have a driver’s license when the cover was pulled from the Audi TT concept at the 1995 Frankfurt Motor Show, but I vividly remember how the automotive world seemed to collapse under its weight. It was not just a radical departure from `90s Audi design themes, but from all `90s design themes. It was so ahead of its time that, despite spending 3 years in the conceptual stage, it still looked futuristic when it finally reached production. It’s also hard to imagine this now, but it didn’t even matter that a manual was the only transmission available. Everyone had to have one. 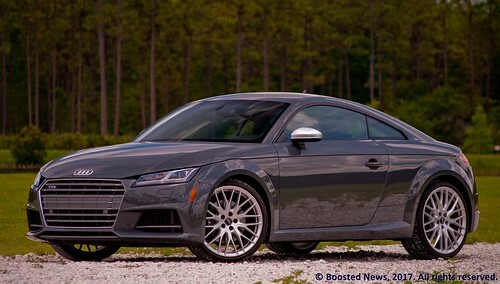 Now, nearly 20 years and two generational updates later, the Audi TT soldiers on with almost no praise or recognition. That’s a shame. In fact, that’s downright unfair. The TT’s face may have changed from curious cheerfulness to wide-mouthed indignation, but the overall shape and purpose of the current TT is essentially unchanged from that of its grandfather. The roof line still rises sharply from the hood and then curves gracefully toward the back, where it ends with the rest of the car. What’s more, a layman could stare at the back of the original TT and the new TT and have a difficult time telling them apart. It’s no longer a cutting-edge design like it was in the `90s, but it’s still very enchanting, and because the current TT is such an uncommon sight, the few that are in public view stand out and turn heads. 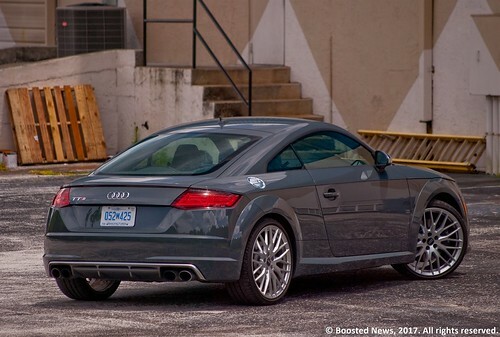 The TT returned to its boosted roots for the third generation, retiring the 3.2L VR6 engine and relying solely on 2.0L TFSI turbocharged, intercooled, and direct-injected 4cyl engines for all models but the upcoming 5cyl TT-RS. 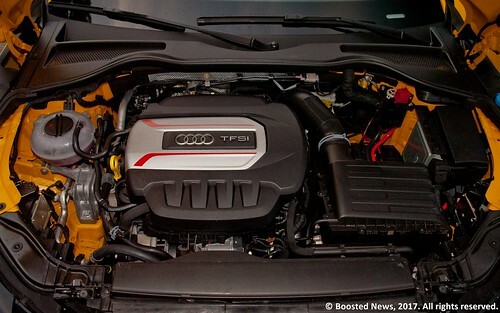 In the standard TT, it produces the same power and torque as a Volkswagen GTI. But in my test vehicle, the TT-S, the output increases to 292hp and 280 ft-lbs, the same as a Golf R or an Audi S3. To the vexation of purists, the TT has gone from being manual only to no longer offering a manual transmission at all. However, the TT’s sole transmission, a six-speed S Tronic (Audi’s name for VAG’s DSG transmission), cannot receive enough praise from me. No, it will never replace the feeling of a good old-fashioned three-pedal stickshift, but no one can dispute that the TT and TT-S are faster cars with the dual-clutch unit handling power distribution through the all-wheel-drive system that made Audi into the household name it is today, quattro. How fast? Fast. As in, blood pressure increasing fast. Put Audi drive select into Dynamic mode and the transmission into S mode, and put your left foot hard down on the brake pedal and then your right foot hard down on the gas pedal. Launch mode will engage, then release the brake pedal and hold on to the girthy, flat-bottom steering wheel tight. 60mph will arrive in just 4.4 seconds, and then the quarter mile is next in just 13 seconds flat at 104mph. The awe that those numbers come from a car with an engine displacing less than the engines in common, mediocre family sedans cannot be overstated. 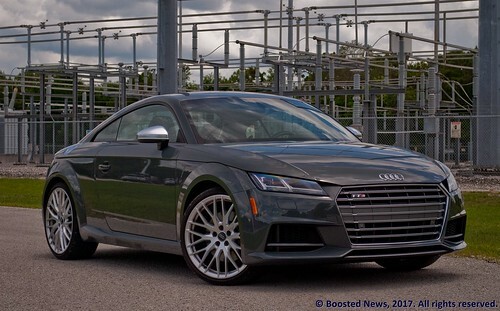 No matter who you are or what you’re accustomed to behind the wheel of your own car, you will be forced to acknowledge the Audi TT-S is a reverentially fast car. The same Dynamic mode reduces assist from the electric steering and activates the magnetic particles in the shock absorbers to firm up the ride and reduce body roll, and with my test vehicle’s optional 20-inch multi-spoke wheels and Pirelli P-Zero summer tires, it can achieve nearly 1g of lateral acceleration at its limits. Surpass 80mph, and the rear spoiler will deploy, keeping the rear end from breaking loose unexpectedly. Enter a corner, and the TT-S simply holds on to the road like a frightened child holds onto his security blanket. There is no understeer, and only a hint of oversteer. It’s not a car for sliding around with plumes of smoke bellowing from its tires. It’s designed to amaze you with its cornering speed just as much as its straight-line speed. What the TT-S is not designed to do is give the passengers anything to do other than hold on and enjoy the ride. The TT coupe is classified as a 2+2, but no one wants to be in the back seat, not even children. The HVAC controls are cleverly integrated into the vents; those and the glove compartment are all the front passenger can access. The driver is in control of everything else. The gauge cluster, or “virtual cockpit” as Audi calls it, is a very complex affair. It can be completely changed from being an information overload with a tach and speedo as well as coolant temperature, oil temperature, turbo boost pressure, date and time, and lots more, to a display for MMI. It can display the navigation screen with legitimate Google Maps satellite pictures, or the audio system where the driver can use voice activation, or the scroll wheel on the center console, or on the steering wheel, to choose a radio station or a song stored on a mobile device. It is intuitive, but will require a new TT owner to spend a good half-hour or so acclimating to how the system works before controlling it with simple muscle memory. The TT-S’ interior is overall a nice place to be. Though the driver has a lot of responsibility, the interior layout is beautiful in its simplicity and lack of clutter. The 12-way power seats are Nappa leather upholstered and sufficiently bolstered for hard cornering. Although the audio system is part of MMI and there is no head unit, per se, the optional Bang and Olufsen stereo is in there somewhere and sends terrific sound throughout the interior, which can be described as cozy, or making efficient use of its space, but not cramped, at least not for the front passengers. So, why hasn’t the Audi TT kept the sales momentum it enjoyed when it first made its debut in the `90s? Perhaps Audi’s insistence on keeping the TT’s appearance largely the same for two decades is working against it, regardless of it still being an attractive design. The inflation of the price, which went from around $35,000 in 2000 to $59,025 as tested has also moved the TT into a different price point. But the fact still remains that the Audi TT is still a very stylish car that makes a statement, and in the case of the TT-S, a true high-performance sports car with ballistic acceleration and masterful handling. It would be a shame for the automotive world to lose that. Test vehicle provided by Audi of America.